WASHINGTON, D.C. -- Americans' evaluations of the economy are unchanged from last week and from most weeks so far this year. 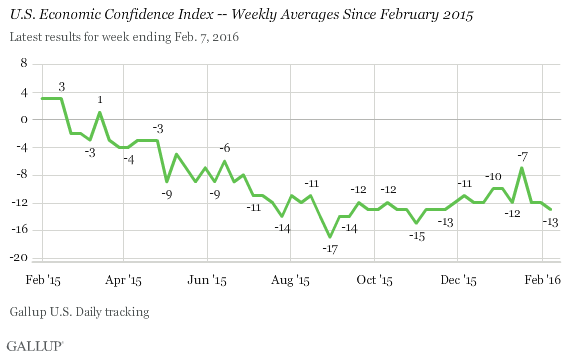 Gallup's U.S. Economic Confidence Index averaged -13 for the week ending Feb. 7. This is similar to scores since September, apart from a brief uptick to -7 after the State of the Union address in mid-January. The Economic Confidence Index was quite strong in early 2015, and consistently reached positive territory each week in January and early February of last year. Index scores fell in subsequent months, bottoming out at -17 in late August. Since that low point, scores have remained within a narrow window of -15 to -10, apart from the brief mid-January exception. Americans' economic confidence has withstood significant volatility in the stock market in recent months and has seemed resistant to a new wave of declining gas prices as well as moderately positive news on the labor front. On Friday, the Labor Department reported that the U.S. unemployment rate dipped below 5.0% for the first time since 2008, although job gains in January did not meet expectations. Confidence has slightly increased since the report's release, with the index averaging -8 in Friday through Sunday interviews. For the week ending Feb. 7, 26% of U.S. adults rated the current economy "excellent" or "good," while 31% rated it "poor." This resulted in a current conditions score of -5, down slightly from -3 the week before but similar to weekly scores in recent months. 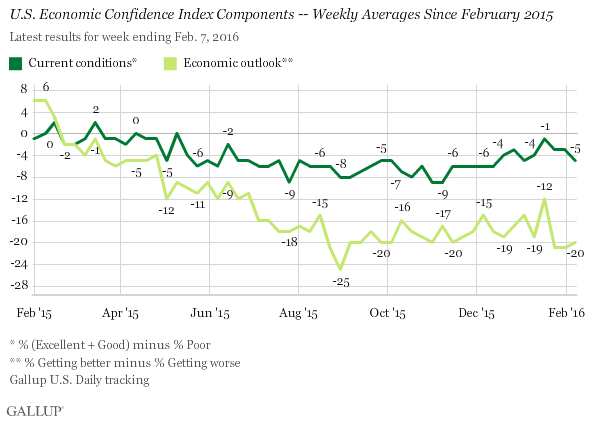 The economic outlook score for the week ending Feb. 7 was -20, similar to recent scores. This is the result of 38% of U.S. adults saying the economy is "getting better" and 58% saying it is "getting worse." Results for this Gallup poll are based on telephone interviews conducted Feb. 1-7, 2016, on the Gallup U.S. Daily survey, with a random sample of 3,038 adults, aged 18 and older, living in all 50 U.S. states and the District of Columbia. For results based on the total sample of national adults, the margin of sampling error is ±2 percentage points at the 95% confidence level. All reported margins of sampling error include computed design effects for weighting. 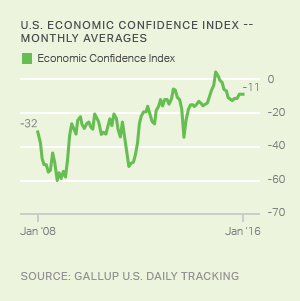 Gallup's U.S. Economic Confidence Index dropped five points to -12 after improving briefly to -7 following the State of the Union address. The index is back to where it has been most of the time since mid-2015.